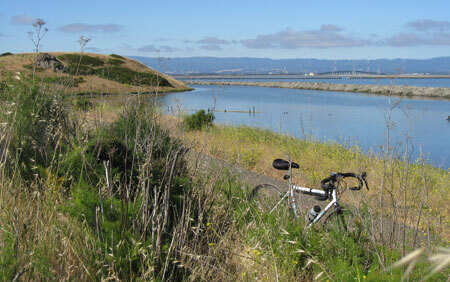 Coyote Hills has a great trail network, which I use to go from the Hwy 84 frontage road to the Alameda Creek Trail. Moving heaven and earth. In this case it’s mostly earth moving at Calaveras Reservoir where the dam will be replaced by 2015 for improved earthquake resistance, we hope. Also in the works on Calaveras Road is the 3.5-mile New Irvington Tunnel, which will run from Sunol to Fremont’s Mission San Jose district, replacing the aging Hetch Hetchy tunnel, which officials fear would fail in an earthquake. 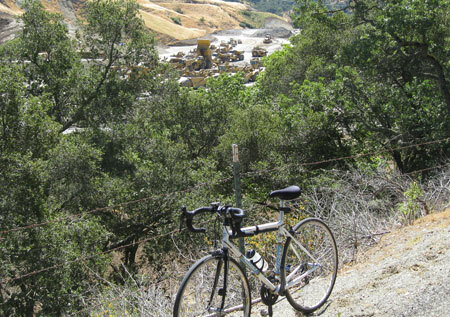 On my Sunol loop ride I took in the lowlands, which makes for a fast ride. Fortunately the ride has a lot of diversity as it takes you along and over the bay, through Coyote Hills, along Alameda Creek and over Calaveras Road. Lots of earth moving continues at Calaveras Road, which remains closed during weekdays, as the new Calaveras Dam is built. It was yet another beautiful day. While climbing Calaveras Road it’s nice to welcome the bay breeze at higher altitudes. The bald eagle nest is still on the power line tower and one of the proud parents was looking down at the reservoir, probably contemplating the next meal to feed the eaglets. This entry was posted on June 3, 2012 at 2:48 pm and is filed under News. You can follow any responses to this entry through the RSS 2.0 feed. You can leave a response, or trackback from your own site.